House Republicans emerged from a two-hour closed-door immigration meeting Thursday without a compromise on the hot-button topic, although conservatives and moderates who have sparred over policy shared optimism about the tone and direction of negotiations. "I really got a sense that everyone wants to get to yes," Rep. Mike McCaul, R-Texas, the chairman of the House Homeland Security Committee and author of a conservative-backed immigration reform bill, told reporters. "Frankly all sides are open, I think the dialogue has been very constructive, and I think we’re moving in the right direction," Rep. Tom Cole, R-Oklahoma, said. 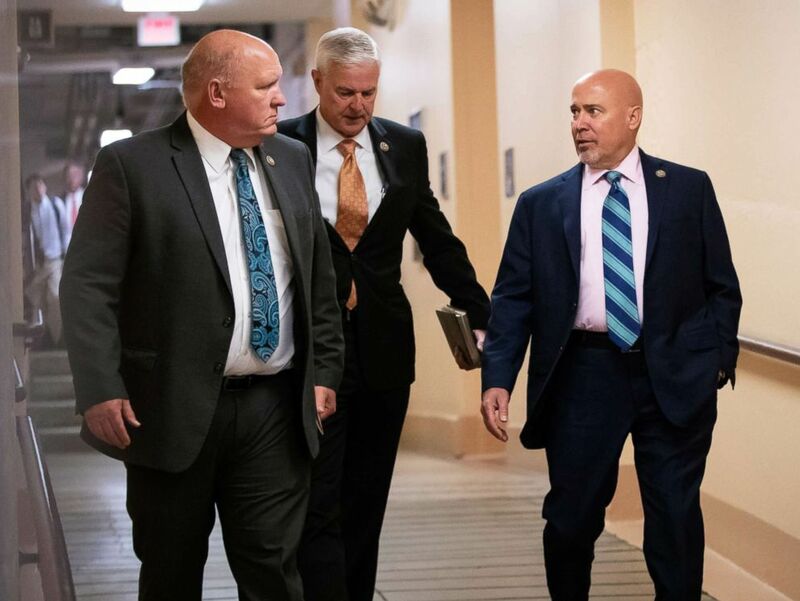 Rep. Glenn Thompson, Rep. Steve Womack, and Rep. Tom MacArthur walk to a closed-door GOP meeting on immigration in the basement of the Capitol in Washington, June 7, 2018. House Speaker Paul Ryan, who walked members through the issues with PowerPoint slides, made the case that any solution needed to coalesce around President Trump's "four pillars" immigration framework laid out earlier this year - border security, a path to citizenship for 1.8 million young undocumented immigrants, limiting migration beyond the nuclear family, and eliminating the visa lottery. While the fundamentals of the debate did not appear to shift after the meeting, Ryan signaled that Republicans would be moving closer to a floor vote. "The next step is to start putting pen to paper," he said while arguing that moderate Republicans' efforts to force a freewheeling immigration vote around GOP leaders with a discharge petition was a futile effort. “A discharge petition will not make law, so I think members realize that it’s better to have a process that could make law, than not,” he said at his weekly news conference. Ahead of the meeting, Ryan faced pressure from both sides of his fractured conference over immigration. More than a dozen Republicans have joined forces with Democrats on the petition, which is just three signatures away from the 218 needed to trigger a floor vote, in an effort to bring up bipartisan immigration legislation on border security and the status of DACA recipients. But House conservatives, worried that a vote on a pathway to citizenship could frustrate their base opposed to "amnesty" ahead of the midterms have pushed for a vote on Rep. McCaul's legislation with Rep. Bob Goodlatte - a conservative bill they say is in line with Trump's campaign promises and includes border wall funding and required use of E-Verify for employers to check the immigration status of employees. Rep. Mark Meadows, R-N.C., the chair of the House Freedom Caucus, told reporters after the meeting that the pathway to citizenship remained one of the largest sticking points in negotiations. "It’s fair to say that that is the biggest issue, I don’t want to say that it’s the only issue," he told reporters. McCaul said he believes moderates will hold off on adding additional signatures to the discharge petition while leadership works to address concerns and amend his proposal. Ryan did not commit to a timeline on legislative action, though some moderates are hoping to hold votes in the coming weeks before the July recess. Some members suggested that additional issues percolated in the discussion beyond the proposals framed by Trump's framework. "There's a lot of details to work out here," Rep. Bradley Byrne, R-Ala. told ABC News as he left the meeting. "Like what to do with [guest] worker visas. There are a lot of people in there ... that have businesses in our district that are really interested in that." But the House Freedom Caucus and Rep. Raul Labrador, R-Idaho, a member of the caucus and the House Judiciary Committee well-versed in immigration, both pushed back on Denham's reported claim, suggesting that negotiations remained ongoing. The House Freedom Caucus has not made an offer on immigration. We are continuing to talk with our colleagues and remain engaged in the process of working toward ideas that will secure our borders, enforce our laws and also address the DACA issue. We are waiting to see what House leadership produces based on input from all of the Members of the Republican conference. "I do not believe in a special pathway to citizenship," Labrador said Thursday.